My goal going into this series with the Brewers was for the Braves to crush a bad ballclub with a bad record. The Braves did that and probably would have gotten a sweep of the series if Alex Wood didn't somehow come down with the stomach flu in his start, forcing Eric Stults aka - the home run machine to take the hill. Game 1 was really odd. Julio Teheran continued to press on with another good start going 7 innings and only giving up 1 run on 2 hits. Thing was, the Braves were tied with the Brewers going into the 7th inning, 1-1. You wouldn't know that by the final score, because Atlanta ended up winning the game 10-1. How you ask? Because the 7th inning was one of the weirdest innings I've seen out of the Braves this year, in a good way. Gomes and Callaspo both singled against Garza, and Simmons bunted into a FC at second. When C-Beth came up with a big single, it made the game 2-1 and the Brewers were forced to bring in Will Smith from the pen. No, not the rapper, the relief pitcher. Things got odd after Smith hit Ciriaco with a pitch, putting two runners on base. 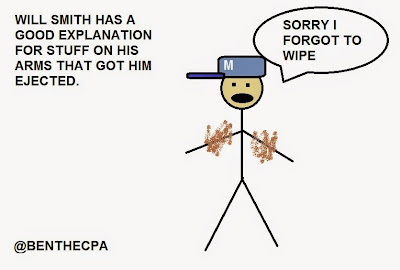 As he was pitching to Jace Peterson, Fredi Gonzalez noticed a very obvious smear of gel-like liquid on Smith's forearm. He brought it to the attention of the umpire Jim Joyce. 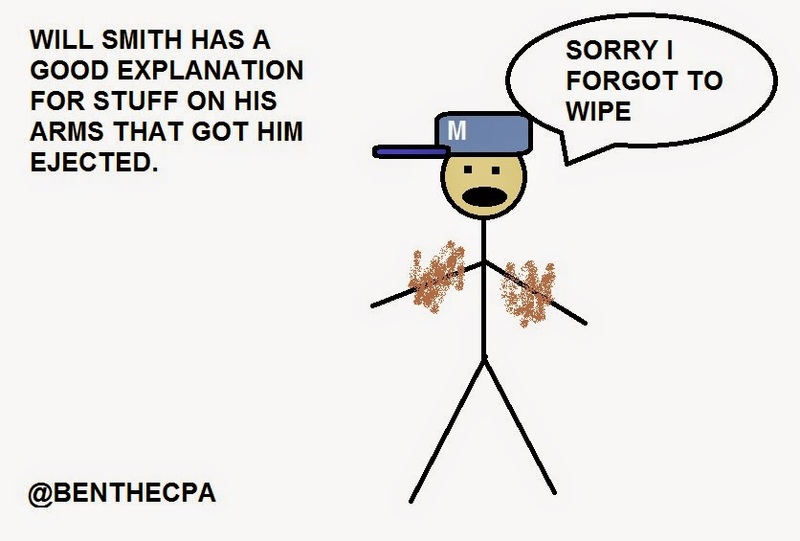 Joyce then went out to the mound to check it, found out it was an illegal sticky substance, and ejected Smith. The Brewers dugout lost their minds, as did Smith. He was yelling obscenities at the Braves all the way back to the locker-room. My response? Hey, you're the one who cheated, why are you mad? Anyway, from that point, the Brewers came unglued. Peterson singled to score Simmons. Maybin singled to score C-Beth and Ciriaco. Freeman singled to score Peterson. Markakis doubled to score Maybin. Gomes reached on a throwing error to score Freeman. When the dust finally cleared, the Braves batted around in the order, and they scored 7 runs. It was a crazy win. Now for the flip side in Game 2. Nothing is worse than a pitcher not making a scheduled start, and the team is forced to scramble. The man they had to put into the position for Alex Wood was Eric Stults, and he was not up to the challenge. If you remember, Stults already lost his starting rotation slot to the likes of Williams Perez and Mike Foltynewicz. My biggest problem with Eric is that he can't keep the ball in the park. Guess what he did in this game? Gave up another 2-run homer to Braun in the 1st inning, and that opened the floodgates. Before you could say BOO, the Brewers had struck a huge blow in the 4th inning, and Stults surrendered 7 runs. So who does Fredi pick to stop the bleeding? Trevor Cahill of course. Yeah. Exactly. Your face should be making the same expression as if somebody cut a huge fart and walked out of the room. Cahill gave up 3 more runs in 1.1 innings. Ian Thomas gave up another run in 2 innings, and the Braves lost 11-0. Let's never speak of it again. Emotionally, you worry about a carryover when a team gets shelled. But the Braves had no hangover in Game 3. Or at least Shelby Miller didn't. Miller didn't even have his best stuff out there, and it was obvious. But Shelby has an Ace mentality, so even when he's pitching sub-par by his standards, he can still battle with the best of them. Shelby gave up 1 run in the first and 1 run in the fourth, but he walked 2 and gave up 7 hits, so he was limiting the damage. He gave the Braves a chance to get back in the game. And the Braves did emerge with some offense in the 5th inning, courtesy of a hit by none other than Shelby Miller. He can do it all. Miller doubled, then Maybin doubled to score him, and then Freeman doubled to score Maybin. Tied 2-2, the game went to extras. With two men on and two outs, Jace Peterson became the hero with a walk-off single to left center, scoring Callaspo for the game winner. He was showered with praise and infield dirt for his efforts. Game 4 was Mike Foltynewicz's coming-out party in my mind. This was Folty telling the world he's ready to be a part of this rotation, and even though he's got a lot to learn, he can do it and be successful at the MLB level. Folty tossed a 3-hit, 1 run, gem of a game where he went 7.2 innings and really saved the bullpen after a night of extra innings. The Braves were not sharp offensively at all, so that pitching effort was the key to the game. Nobody scored in the game until the Braves finally broke through in the 6th inning with 2 runs. It happened on a strange bases-loaded dropped liner that could have been a double play, but the Brewers defense hesitated and AJ Pierzynski beat the rap. That scored one run, and Simmons singled after that to score the 2nd. The Brewers would get one back in the 7th on a sac-fly, but Grilli came in for the 9th to get his 13th save and shut the door. Mike Foltynewicz dominating - The kid looked so good, I was actually shocked. He's had issues with giving up too many runners before, but in his outing against the Brewers he only allowed 4 baserunners in almost 8 innings to go with 7 Ks. Braves RISP hitting - Atlanta went 12-39 in the series with RISP, and that's a .308 average. The Braves RISP hitting average on the year is .296, and that's 3rd in the MLB. Shockingly different from last year. Jace Peterson game-winner - the kid has been working hard, and it's great to see it finally pay off for him. Maybe he can ride this to a surge of offense. MVP of the series? Honestly, I'm giving it to Cameron Maybin, an unsung hero of this series. He reached base 7 times against the Brewers, scoring 5 runs, and stealing 2 bases. He was a terror on the basepaths, and he managed to knock in a few runs as well. When you look at the whole, Maybin was involved in 8 of the Braves 15 runs of offense. He was over half. That's why he gets the MVP for the series. Next up, we go on a long road trip that starts with the hot LA Dodgers. I hope we don't have jet lag. Hey look, the worst team in the NL is in town! Who the Heck is Todd Cunningham? Who the Heck is...Mike Foltynewicz?